Something a little different this time. Golden Lane, Dublin 8, dates from 1466 and is one of the oldest streets in the city. However, nothing exists on it now that pre-dates the twentieth century. 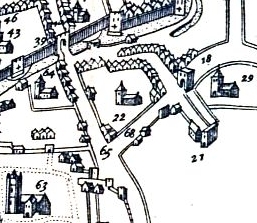 The lane was marked on Speed’s Map of Dublin of 1610. Looking in the bottom-right corner and using St Patrick’s Cathedral (63) as a guide, Cross Lane (68) runs north-east towards a gateway and on to St Stephen’ St (18), just as it does today. Churches at Ship St and Whitefriars (22, 21) are visible to the north and south of the lane. Cross Lane is such an appropriate name, as anyone who walks in this area knows—it is the main pathway for going from Clanbrassil/Patrick’s St to Aungier/George’s St. Nevertheless, the arrival of a Guildhall for goldsmiths resulted in a name change that has stuck ever since (MacGiolla Phadraig, 1945). What was Golden Lane like? In the eighteenth century, it was home to middle class people like Sir Fielding Ould, obstetrician, Thomas Mathews, land surveyor, Roger Smith, upholder and auctioneer, and an academy run by Samuel Edwards, “the most eminent schoolmaster of his day” (Daly, 1945, Gibney, 1958, Mapother, 1878, Fitzgerald, 1987). In the 1774 election for MP for the city of Dublin in parliament, Edward Cusack, John Pearson Esq and William Bayley Esq, all freeholders living in Golden Lane were recorded as voters (for the winning man, Redmond Morres Esq). A map by the Wide Street Commissioners of a portion of Golden Lane showing houses at the junction of Chancery and Golden Lanes drawn in 1722 is on the Dublin City Libraries website shows a well established street, and by 1735, the street already had 72 perches of pipes for water, according to Richard Cassels, who completed survey of the city. A 1728 murder trial mentions a watch house on Golden Lane. 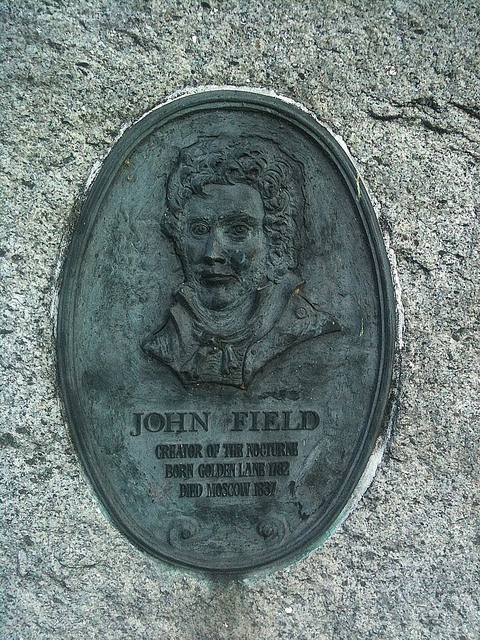 Of course the street’s most famous son is John Field, who was born in Golden Lane in July 1782, and was baptised at St. Werburgh’s Church on the 5th September, 1782 (de Valera, 1982). This is the basis of one of Dublin’s most unusual plaques, located at the corner of Golden Lane and Bride St. The plaque shows an engraving of Field along with the citation: “Creator of the Nocturne Born Golden Lane 1782 Died Moscow 1837.” Field’s baptism-place is also marked with a plaque. Other listings include provisions dealers (5), a pawnbrokers, a tallow chandler, and rather pleasingly, James Nolan, a hairdresser at No. 26. There were two circulating libraries: James Lyons who ran a circulating library and delph shop at No. 35 and Alicia Crosby ran a circulating library at No. 53. These seem to have been a kind of private library offering cheap access to books of interest of the day. Despite the name of the street, there were just two jewellers, and one of these, John Norton, doubled up as a shoe broker! One house was listed as a tenement. By the twentieth century, the street had joined so many others in terminal decline. Christiaan Corlett’s important book, Darkest Dublin, has several photographs from Dublin in 1913, including one showing dozens of children outside a house on Chancery Lane, off Golden Lane. In the 1901 Census, the street was dominated by tenements. Of the 60 buildings on the street in 1901, 28 were listed as tenements, 7 of these with a shop at their base. A further 5 were public houses and there was also a spirit store. Ten buildings were given over to timber stores and manufactory. Number 17 was a telephone depot. No. 5 had five families consisting of 37 people living in the four room house, ironically because of its physical condition was classified as “1st class”. These included Michael Swaine (23), a Commission Agent, and his young wife Rosanna (20) and their infant; the family of Alexander Porter, carpenter, and his wife Margaret, their eight children and his wife Margaret’s father; Jane Gannon (56), her two grown children and a boarder; Thomas Corcoran (43), labourer and his family of six; and Joseph Byrne (46), packer, his wife Eliza and seven children. Eleven of the 37 people in this house were recorded as members of the Church of Ireland. Now in the 21st century, nothing of the original remains with the last of the “Georgian” houses being demolished in the early 1980s (de Valera, 1982). The Lane is dominated by The Radisson Hotel on the north edge and there are two corporation housing units on the south end. Having existed for 550 years, I’m sure there is plenty more yet to happen at Golden Lane. 650 years is an under-estimate, as I have omitted some interesting archaeology from this article – see for example: Archaeology Ireland, 2005, 19(3), 16-17 on Viking Age burials uncovered at Golden Lane. 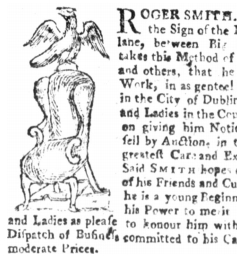 Richard Castle (Cassels), 1735, An essay on supplying Dublin city with water. Christiaan Corlett, 2008 Darkest Dublin. The story of the Church Street disaster and a pictorial account of the slums of Dublin in 1913, Wordwell. (The Little Museum of Dublin, Stephen’s Green, are currently exhibiting these photographs). Terry de Valera, 1982, John Field, 1782-1837, Dublin Historical Record, 35(4), 134 – 147. Frank Gibney 1958, A Civic Achievement, Dublin 1760-1800, Dublin Historical Record, 15(1), 1 – 10. Desmond Fitzgerald, 1987, Early Irish Trade-Cards and Other Eighteenth-Century Ephemera, Eighteenth-Century Ireland, 2, 115 – 132. Cormac F. Lowth, 2008, Dublin Jack of All Trades, Dublin Historical Record, 61(2), 169 – 182. Brian MacGiolla Phadraig, 1945, Speed’s Plan of Dublin, Dublin Historical Record, 10(4), 97 – 105. E. D. Mapother, 1878, Great Irish Surgeons, The Irish Monthly, 6, 12 – 19.